Paleo Apple Cobbler. Apple desserts are my most favorite desserts. 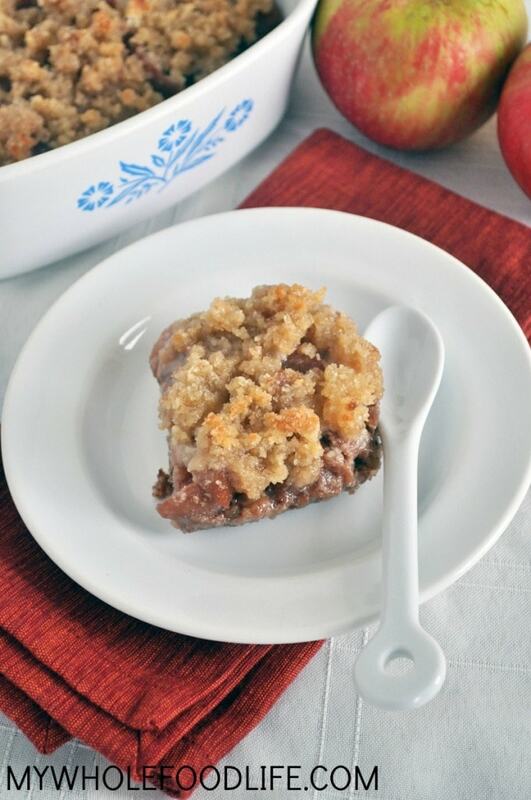 This paleo and vegan apple Cobbler is my new favorite! I already had one healthy apple cobbler recipe on my blog, but I wanted to create a grain free version, so that is where the inspiration came for this. I used pecans in the bottom crust layer, and they really go fantastic with the apples and cinnamon. Slow cooking the apples first allows much more natural sugar to develop, so there is not too much need for a lot of added sugar. This is absolutely delicious topped with some coconut whip cream. In a food processor , combine the crust ingredients until a loose dough starts to form. Press the dough into an 8x8 baking dish and set in the fridge. In a slow cooker , add all the filling ingredients. Turn on high and cook until the apples soften. About 1-2 hours. You can also do this on the stove top if you prefer. That should only take about 30 minutes. I like to slow cook to bring out more sweetness. Using a slotted spoon, pour the finished filling on top of the crust and set aside while you make the topping. In a food processor , combine the topping ingredients. Sprinkle the topping over the apples and place in the oven. Bake about 25 minutes or until the topping looks a golden brown. can you substitute the almond flour with anything? You can use another flour instead. Do you think I'd be apple to make individual servings of this ? Definitely! Just adjust the cooking time. I made this yesterday (followed the recipe exactly, except I added a little cinnamon to the topping mix because we like lots of cinnamon in baked apple recipes; also, I used regular sugar because I was out of coconut sugar). It got a thumbs up all around. We are looking forward to eating the rest of it tonight. I will add this recipe to our "keepers" collection. Thanks for sharing! You are so welcome Bonnie!! So glad you liked it!